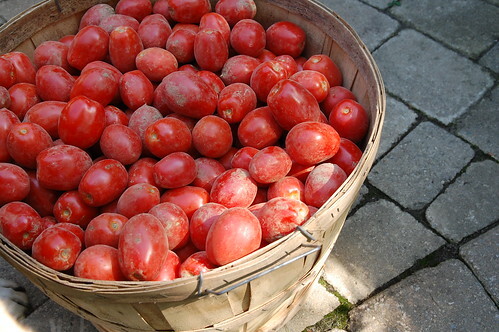 Gayla had mentioned that Fiesta Gardens was selling bushels of San Marzano tomatoes that were perfect for canning. Pumped up from the canning workshop, I got it into my head that I might attempt to can some tomatoes on my own. I had an extra day off over the Labour Day weekend, so Sunday we drove over to the nursery and picked up a bushel. Actually, Andrew picked it up (literally), hauled it into the car, into our backyard and washed all 300ish tomatoes. Once you have that many tomatoes in your possession you are committed to doing something with them as quickly as possible. Over the course of two days, I canned 28 pint jars, made 3 bottles of homemade ketchup and oven dried four baking sheets of halved tomatoes sprinkled with sea salt. The phrase, ‘slaving in the kitchen’, certainly came to mind several times. Don’t get me wrong, I did enjoy myself but it’s a huge time commitment. With each batch, I became more efficient and I also fell into a good rhythm with all the different tasks that need to be done. By the end, I was pretty accurately calculating how many tomatoes to blanch and peel to fit my seven jar batch without leftovers. The one problem I ran into was having some of the jars leak when removed from the hot water bath. This was super frustrating. I thought I hadn’t tightened the lids enough, but it happened again with the next batch. Googling the problem didn’t give me any clear insight, but luckily a quick tweet to Gayla was answered with the suggestion to leave the jars in the hot water bath a bit long to allow for a longer ‘calming’ period after the forty five minute processing time. This was exactly my problem. The very last batch was allowed to calm in the hot water for a longer period of time and they turned out perfectly. All the jars sealed, but the ones that leaked I’ve put in the fridge for consumption now. I like the idea of preparing for winter like a squirrel and stashing away my little jars of food. I’m very much enjoying the dried tomatoes now though. The concentrated flavour is so delicious. I made myself an omelet for dinner last night with dried tomatoes, goat cheese and green onions. YUM! A few of you have asked me if I’ve made my pear jam this year. I just received a bundle of pears from my mom, so this weekend will be all about preserving pears. NOTE : Gayla sent me a message regarding my leaky jars, that I thought you might like to read. 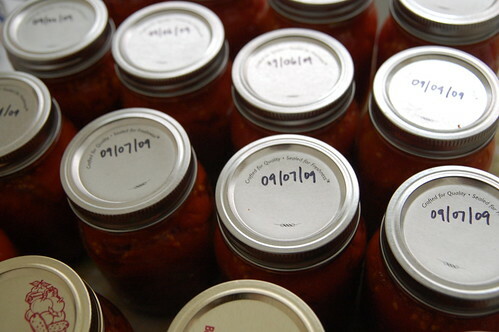 Canning can be a bit nerve wracking when you’re worried about potentially poisoning yourself and your loved ones. It’s great to have a mentor who gives reassuring advice. “Personally I think the jars that sputtered will be okay. As long as they are properly sealed they will be fine and the sputtering was just that they were hissing in the water and pulled out before they had stopped. When this has happened to me I just wipe them all down carefully with a warm wet cloth so I knew they were clean before putting them away. I then check for any further leakage a day later to be sure.” Gayla also did a post today about her love affair with canning that also links to some of her great recipes. you are amazing (as usual). i have the week off, so I must get to work on my own tomato slave fest. 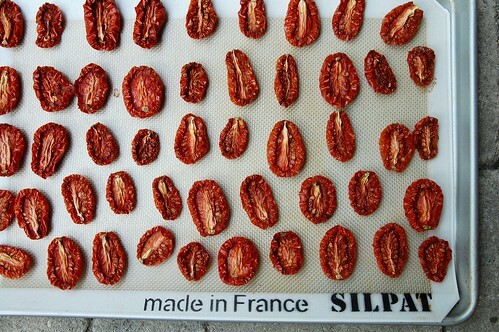 Yum, sun-dried tomatoes. Looking good. Congratulations! And how exactly did you dry the tomatoes? I tried it once and they definitely did not look like yours! I’d love to have better instructions. I just looked at your pear jam recipe. I have a pear tree in my backyard that is bursting right now…how many pears make up 5 pounds? By the way, I don’t live too far from Fiesta Farms…do they sell jars there as well?? Jill – I can’t wait to hear how your canning goes. i feel very proud of my results, though i have yet to taste them! elk & adele – thanks! 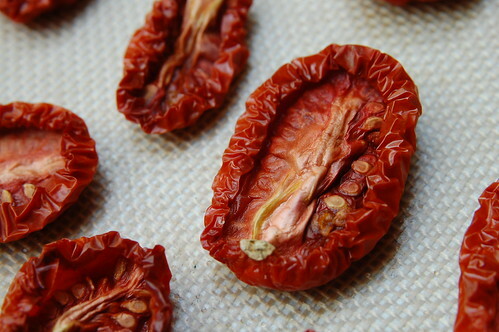 shin ae – The way Gayla told us to do the roasted tomatoes is super simple. Just slice them in half and sprinkle with coarse sea salt. Put them in the oven at the lowest temperature and bake them for 10 hours. I put them in before I went to bed and took them out in the morning. I left them in longer than 10 hours because they still seemed moist. The next night I put them in at 200F and that seemed to work better. miss crowland – i honestly don’t remember how i figured out how many pears to use for the recipe last year. i think i just tried to estimate five pounds. this year i’ll write it down. i’m not sure if fiesta farms sells jars, i bought mine at home hardware. let me know if you find out that they do. Also, for all getting into canning/preserving can I recommend a dehydrator? We had one when I was growing up and I lived off natural fruit leathers, dried fruit and dried yoghurt for years. Seriously, dried yoghurt is like candy, it gets chewy and sweet and you can freeze it and then it gets kinda crunchy…so good. i think that the tomoato expedition is amazing and a little cuckoo, in the bestest way possible! honestly, it’s incredibly inspiring. i might even do it next year! Hi, I bottle my tomatoes in the old type quart soda bottles. First washing the tomatoes then boiling them for a short time, and then putting them through this electric machine that seperates the skin and seeds from the juice. Next I put the juice in the quart bottles and cap them, then put them in a boiling water bath. I did this two weeks ago and this week found two bottles broken in the cellar where they are stored. One bottle the cap blew off the bottle broke as well and perhaps the second bottle broke from the pressure of the first breaking. Would you know why the bottles may burst? I need something more easy to preserve tomatoes, because gas in Guatemala (my country) is very expensive. I saw once ago like broiled tomatoes and looked so tasty, I didn´t try them. Thank you so much for sharing the oven-roasted idea! I’ve canned so many jars of sauce and salsa, and I have something like 8 pounds left to preserve. We have a home garden, and the rest of our tomato crop is ripening in boxes on our counter. Definitely going to try this idea as they ripen up!